'I know I'm going to die. I just don't know when. And worrying about when it's going to happen is killing me.' - U.S. Fighter Pilot, World War One. When the First World War broke out, powered flight was barely a decade old. Within the first few months of the war, the first flimsy aircraft would change ground warfare forever. An Allied reconnaissance plane spotted a crucial weakness in the German lines at the Marne in August 1914. However, as the Allies massed in attack, a German aircraft saw them and the element of surprise was lost. Armies could no longer manoeuvre without being seen - and the era of trench warfare began. At first rival pilots regarded each other as brothers, but the desperate need to knock out the enemy 'eye in the sky' led to the swift development of the first fighter aircraft. World War One would be fought with equal ferocity in the air as on the ground. The life expectancy of a pilot could be as little as 3 - 6 weeks. 17,000 pilots would die in the air, earning the aircraft the grim nickname 'Flying Coffins'. 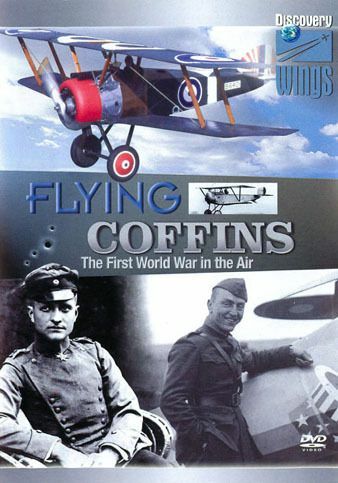 With rare film footage and the testimony of a WWI fighter pilot, FLYING COFFINS traces the development of the aeroplane over the course of the war, along with the tactics and technology used. It also features stunning colour and air-to-air film of the WWI vintage replicas at Old Rheinbeck Aerodrome including the Sopwith Camel. Nieuport 11, Fokker Triplane and Albatross, as well as exclusive interviews with the men who restore and fly these magnificent old aircraft today. - Note - Part 2 contains DVD extras which I decided to add in the release, about 15 mins of nice widescreen footage shot from various UK airshows and including flying examples of S.E.5 and Bristol F.2 Fighter among others. Because of aspect ratio difference I couldn't simply join it to the main movie. This page was last modified 23:32, 22 March 2019. This page has been accessed 8,358 times.